UDM Downloads > File Drawer! 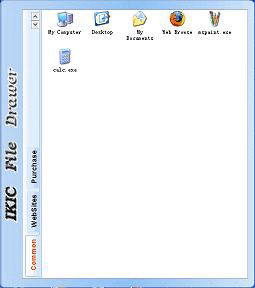 IKIC File Drawer is used to quick start programs, quick open files, quick open folders, quick open website, just do these with File Drawer. Very fast and convenience just by drop your target into File Drawer. It is the best quick start product. why you should use File Drawer? First, when you want to open a file in a deep folder, it will take you much time to open the folders step by step, that's carking. With File drawer,what you need to do is just click the file from it, or open the folder by the menu "go to location". Second, When you want to open a website, you should open your web browser first, and then enter the address or open from bookmark or favorite. Now with File Drawer, you just need click the site in File Drawer item view. Also, add websites into File Drawer is very easy, drop websites from your web broser into File Drawer. Third, maybe you can create a shortcut on your desktop, but don't you feel disorder if there are too many shortcuts on the desktop? With File Drawer, it can keep these shortcuts in it's windows, which hide on the left side of your screen. Fourth, File drawer thinks more for your convenience, most time it hides the window on the left side of your screen, when you want it, just move your mouse to the left side of the screen. In a word, File Drawer can help you more. For more detail, see help document. Features 1.Quick start programs, quick open files, quick open folders, quick open websites. 2.Fully support drop. 3.Main window auto hide, and auto show just by move your mouse.